IMG-1312D is an innovative 1 port RS232/422/485 and IEEE802.11 b/g WLAN Access Point VPN gateway with 2 port 10/100Base-T(X) ports. 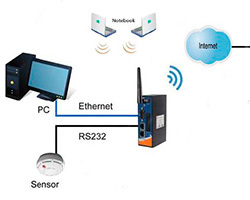 It could be configured to connect to the internet by dialing up 3.5G cellular modem to fulfill demands of various applications rapidly and construct the WLAN environment. IMG-1312D are also equipped with four 5V TTL Digital Inputs and four Digital Outputs. In addition, IMG-1312D can also transfer SSL encryption data into 5 host PCs simultaneously for backup purposes.